Tracherine is a vaccine against IBR (Infectious Bovine Rhinotracheitis) in cattle. The vaccine is given as a liquid directly into the nose and is effective after just 4 days and lasts for about 6 months. Signs of respiratory infection are reduced and viral shedding by infected animals is reduced. A freeze-dried pellet, each dose containing live attenuated Infectious Bovine Rhinotracheitis (IBR) virus strain ts RLB 106, minimum 105.5 CCID50* supplied together with a vial of sterile diluent for reconstitution. Also contains traces of neomycin sulphate and gentamycin sulphate. 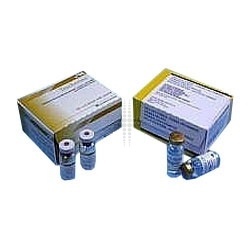 For the active immunisation of calves and growing cattle to reduce viral shedding and clinical signs caused by Infectious Bovine Rhinotracheitis virus (Bovine Herpes Virus type 1). Onset of immunity occurs by 4 days after vaccination. Duration of protection has been demonstrated for up to 6 months after vaccination. Reconstitute the entire contents of the vaccine vial with all of the sterile diluent using the needle and syringe provided. For each animal, withdraw 2 ml of reconstituted vaccine, substitute the needle with the nasal applicator and instill 2 ml into one nostril, holding head up gently but firmly. One applicator is supplied for every dose. Take care to avoid the introduction of contamination while reconstituting and withdrawing the vaccine. The vaccine should be used immediately after reconstitution and not stored. A single dose of vaccine should be administered. Since maternal antibodies may interfere with the development of immunity in very young calves it is advisable to give two doses of vaccine, at least 14 days apart. The first dose may be given at any time from 3 weeks of age. The second dose should not be given until at least 10 weeks of age. In order to maintain immunity, animals should be revaccinated every 6 months with a single dose of vaccine. Alternatively, in areas where IBR is enzootic, revaccination can be given before outbreaks are expected. In particular bought in heifers or dairy replacements returning to the herd after being reared elsewhere, should be vaccinated before joining adult cows. Do not vaccinate animals for at least one month after cessation of corticosteroid treatment. Do not vaccinate unhealthy animals. Vaccination may be followed by pyrexia, which may last from 1 to 4 days and will usually resolve without medication. No post vaccination reactions other than those listed above have been observed with a ten times overdose with Tracherine. The vaccine virus may spread to susceptible contact animals, which may cause these animals to seroconvert to IBR virus. It is therefore recommended to vaccinate all animals housed together at the same time. If an anaphylactic response occurs, institute appropriate antihistaminic therapy. No special precautions are needed for other livestock, vaccinators or stock-handlers. Store and transport between +2°C and +8°C away from light. Do not freeze. No information is available on the safety and efficacy from the concurrent use of this vaccine with any other except Rispoval™ RS. A decision to use this vaccine before or after any other veterinary medicinal product therefore needs to be made on a case by case basis. Do not mix with any other veterinary medicinal product except the diluent provided. Packs containing a 5 dose vial supplied together with a vial containing 10 ml of sterile diluent. Also supplied in a cardboard carton containing 20 x 5 dose vials supplied together with 20 x 10 ml vials of sterile diluent. Not all pack sizes may be marketed. Needles and syringes for reconstitution and nasal applicators for vaccination are provided in separate accessory packs. Tracherine can be used during pregnancy. There are currently no questions for Tracherine - be the first to ask one!